In writing of the Battle of Bunker Hill, Abigail Adams called it the Decisive Day. In many ways this first major battle of the Revolutionary War predicted the character and outcome of the rest of the war. On June 17, 1775 it took a force of 3000 Redcoats three assaults to dislodge the Colonial Militia from a hastily constructed redoubt atop Breed’s Hill in Charlestown. It was largely due to a lack of ammunition that the Militia was forced to give up defense of the hill. The supposed shortage of ammunition led to the famous order Don’t fire until you see the whites of their eyes, variously attributed to different commanders involved in the battle. At battle’s end, the British had 1000 casualties, a staggering number including one quarter of the officers they would lose in the entire war. While technically a British victory, Bunker Hill proved that Colonial forces could fight effectively against the British. American General Nathanael Greene wrote of the battle, I wish I could sell them another hill at the same price. The cornerstone of the monument was laid in 1825 by Revolutionary war hero Marquis De Lafayette on the 50th anniversary of the battle. 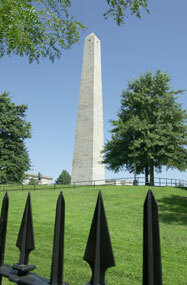 The 221 foot granite obelisk would not be completed until 1842.